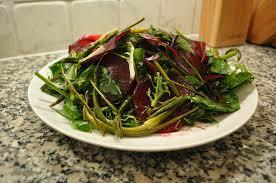 To roast the beets, preheat the oven to 425 degrees F. Trim the stems on the beet to 1/2 inch and wash well. Put them in a shallow baking dish large enough to hold them in a single layer. Pout 1/2 inch water into the dish and cover dish with aluminum foil. Bake the beets until a pairing knife easily pierces the center of the beet, 30 to 60 minutes, depending on the size of the beet. The water will form a syrupy liquid and bubble up. You may need to add a little more water near the end; don’t let the water completely dry up. Remove the pan from the oven, remove cover, and let beets cool. Cut the top and tail off each beet and rub them under running water to slip off the skins. Or you can hold each beet with a paper towel and rub off the skins. Cut each beet into 8 wedges. Stir together the lemon zest, lemon juice, maple syrup, dill, shallot, salt and pepper. Coat the beets with this dressing and let sit at room temperature for at least 1 hour or cover and refrigerate overnight. Wash and dry the endive and remove any thick stems. Cut into bite size pieces. Pour the olive oil over the beet mixture, then combine with the endive. Taste for salt and pepper. Garnish with toasted walnuts.